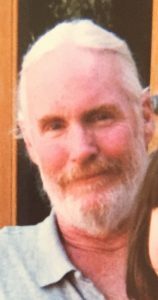 Longtime Harthaven and Los Angeles resident Peter M. Grandfield died at his home in Brookline on Dec. 27, 2018, following a diagnosis with ALS. Since his birth in 1952, Peter spent every summer at his family’s house on Martha’s Vineyard. He learned to swim and sail at the Vineyard Haven Yacht Club, and was a popular tour bus driver for many summers in the ’70s and ’80s. He moved to Los Angeles in the late 1980s, fulfilling a lifelong dream to work in the entertainment industry. He worked behind the scenes on “Glory” and many independent films. He later joined the Teamsters, working as a driver on movie sets and studio lots. He had a dry, observant sense of humor, and was a kind, generous, and reliable friend who was very well liked wherever he worked and lived. He was an avid photographer as well as an expert board game player and puzzle solver. He is survived by his siblings, Dorsey, Michael, and Mark Grandfield; by Mark’s wife Tova Ferro; nieces Kate and Ava Grandfield; grandniece Lillian Geary; and many cousins and friends. He is predeceased by his parents, Dorothy Grandfield of Brookline, and Joseph Grandfield of Florida. One of Peter’s proudest roles was as uncle to his nieces. He was deeply loved, and will be sorely missed. A funeral service is planned for January 5, 2019 in Brookline. There will be a memorial and celebration of his life on the Vineyard in late spring.